Atago — Japanese premium Tier VIII cruiser. Developed from the Myoko-class cruisers. 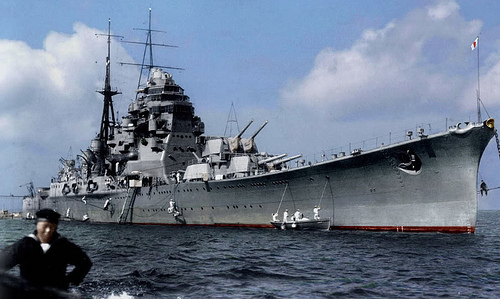 When commissioned, Atago was one of the most powerful heavy cruisers in the world. The ship surpassed the speed of all Japan's potential rival cruisers. For her time, Atago was well-armored with efficient AA armament, along with powerful artillery and torpedoes. 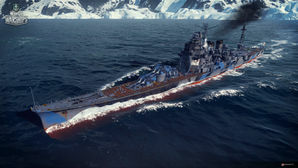 Atago was the first Tier VIII premium ship released for World of Warships and replaced Kitakami at the end of the Closed Beta. Bearing the same ABC-XY turret layout of her historical predecessor Myoko, this heavy cruiser is fairly similar to her predecessor, but improves on many traits such as turret traverse and overall handling. While her main battery rate of fire is slower, her torpedoes are quadruple tube mounts (for a total of 16 instead of 12) and the forward launcher on each side fires forwards instead of backwards, making it useful against enemies in front of the ship. She also gains access to the Repair Party consumable, allowing her to recover HP, unlike most other cruisers (at Tier VIII). Her impressively low detection range means that she can engage the enemy at her terms, and if situations go awry she can sneak away (providing there are no aircraft patrolling the sky or a nearby destroyer to detect her. With a full concealment build she can even fire torpedoes from beyond her detection radius in certain situations. She does have a few drawbacks, with a very large citadel hitbox — due to the large bridge/boiler area amidships — as well as a slow rate of fire and a mediocre anti-aircraft suite, but she is overall a very powerful ship. Has the access to the Repair Party consumable, allowing for HP recovery like battleships and higher tier cruisers. Much wider torpedo launch arcs than regular tech tree Japanese cruisers; having 2 front-mounted and 2 rear-mounted allows for more flexible torpedo usage. Low detection range; with the Concealment Expert skill, the cruiser has an astonishing 9.1km detection range. Lethal HE shells with excellent fire starting capabilities and damage. Modules -- notably the rudder, gun turrets and torpedo tubes -- are very easy to disable. Slow turret traverse; however, Expert Marksman mitigates some of this. As a premium ship, Atago doesn't have any upgrades to research. As a premium ship, Atago comes included with Type 10 camouflage that lowers her detection radius, reduces the accuracy of incoming shells, and increases the amount of experience she earns. Atago is far and away the fastest Tier VIII cruiser in the game; a Sierra Mike ( ) signal is recommended for captains who are interested in maximizing that speed. Zulu Hotel ( ), Victor Lima ( ), and India X-Ray ( ) signals are also recommended. Zulu Hotel will add additional commander XP for faster retraining for a transferred captain, and Victor Lima and India X-Ray add an additional 2% to the fire chance of her main battery high explosive shells. Atago's low draft means she has very good concealment, allowing her to control the engagement. Atago's torpedoes are capable of firing forward, making them an excellent offensive weapon. Atago's high explosive shells are great at starting fires on enemy ships. Atago fires a broadside at an enemy battleship, resulting in two fires. Atago engages an enemy Mutsuki, eventually scoring the kill for a First Blood achievement. Originally planned to be built as Myoko class cruisers, Atago and her sister ships were redesigned into the newer Takao class heavy cruisers. This new design was created to address many of the issues with the previous classes as well as incorporate knowledge learned from the experimental cruiser Yūbari. The new hull design was very similar to those prior, but it featured a shorter and thicker armor belt as well as deck mounted torpedo launchers instead of hull mounted tubes. The new cruisers were also designed to achieve higher maximum speeds than their Allied counterparts. The Takao class was the first class of cruisers designed to carry the new 203mm guns which were later fitted onto most Japanese heavy cruisers. These guns were originally designed to be dual purpose and could elevate as high as 70 degrees. This was later reduced to 55 degrees after the high angles began to cause issues and damage to the guns. Like the Myoko class, Atago and her sisters had their main armament mounted in a pyramidal group forward and a superfiring pair in the aft. It wasn’t until the first Myoko class cruiser was completed that the Japanese designers realized that the new ships would be over the 10,000 ton weight limit. Despite lighter alloys and welding being utilized much more during construction, the new ships were still over the design weight and as a result, suffered from lower speeds and stability issues. To help alleviate this, the planned torpedo armament was reduced from twelve torpedo tubes mounted in four triple launchers to eight torpedo tubes in four double launchers. Later refits and upgrades increased the hull strength and stability of the Takao class ships. This allowed the cruisers to have their torpedo armaments increased to sixteen tubes mounted in four quadruple launchers. The anti-aircraft and secondary armaments of the cruisers were also built up continuously since their completion and entry into service. Atago was commissioned on 30 March 1932, one day before Takao. The newly completed cruisers were assigned to the 4th Cruiser Squadron in December, but later removed to undergo alterations to address the stability issues with the ships. Atago’s sister ships Takao, Maya, and Chokai all rejoined the 4th cruiser squadron by 1937, but Atago herself would remain in reserve until 1939. During this time, Atago underwent her first modernization, receiving upgrades to her hull strength and armament. Atago then joined Takao in conducting patrol operations off the coast of China until December of 1941. Following the attack on Pearl Harbor, Atago sailed in support of the invasion of the Philippines and Malaya. In early 1942, Atago and her sister ships conducted operations in the Dutch East Indies, participating in the Battle of Java Sea. The cruiser squadron participated in raids on American convoy ships and destroyed numerous Allied destroyers and small warships. At the conclusion of the campaign in the Dutch East Indies, Atago returned to Yokosuka where she received her second modernization. The ship’s anti-aircraft armament was increased and the existing secondary guns were replaced with the newer dual purpose 127mm guns. After completing her modernization, Atago escorted the Japanese fleet at the Battle of Midway but did not actively participate in the battle. In late 1942, Atago was deployed to Truk in response of the American push into the Solomon Islands. While Atago participated in both the Battle of the Eastern Solomons and the Battle of Santa Cruz, she only played a minor role during the engagements. On 15 November 1942, Atago, Takao, and Kirishima engaged the American battleships USS South Dakota and USS Washington. The Japanese ships were able to score numerous damaging hits on South Dakota. Ultimately, Kirishima was lost and the two cruisers suffered minor damage resulting in their return to Kure for repairs. Atago would again return to the Solomon Islands in early 1943 to assist in the evacuation of the area. Atago was later deployed to Rabaul in preparation to attack the American forces landing on Bougainville. However, this effort was stopped when on 5 November 1943, the forces stationed at Rabaul came under attack from Allied aircraft from USS Saratoga and USS Princeton. Atago again sustained minor damage and returned to Japan for repairs. While in Yokosuka, the ship received additional anti-aircraft weapons as well as a newer radar system. In January of the following year, Atago returned to service and conducted minor operations while stationed at Truk. The ship later sailed in support of the Japanese Fleet at the Battle of the Philippine Sea, but did not engage any targets. Atago returned to Japan for the final time in July and received additional anti-aircraft weapons as well as upgrades to her radar mounts. With her last refit complete, Atago sailed to Singapore where she would join the First Mobile Striking Force and serve as the fleet’s flagship. The Japanese force departed on 22 October 1944 and sailed for Leyte Gulf. White en route to Leyte, the Mobile Force came under attack from two American submarines, USS Darter and USS Dace. Atago was hit by four torpedoes from Darter and despite attempts to keep the ship afloat, sank in the waters off Palawan Island. The First Mobile Striking Force would continue towards Leyte in an attempt to halt the American landings in the Philippine Islands, but would ultimately result in the loss of much of the remaining Japanese naval forces. More than half of Atago's 25mm/60 anti-aircraft guns are missing. Her actual AA complement consisted of sixty (60) 25mm guns in four quadruple, eight twin and 32 single mounts. In addition, two twin mount 13.2mm AA machine guns are also missing. Colored photo of Atago, 1932. Atago at Yokosuka Naval Base, Japan, 30 Nov 1939. US Navy Office of Naval Intelligence (ONI) reference document on Atago. Detailed ONI document of Atago project. This page was last modified on 20 February 2019, at 19:43. This page has been accessed 136,459 times.